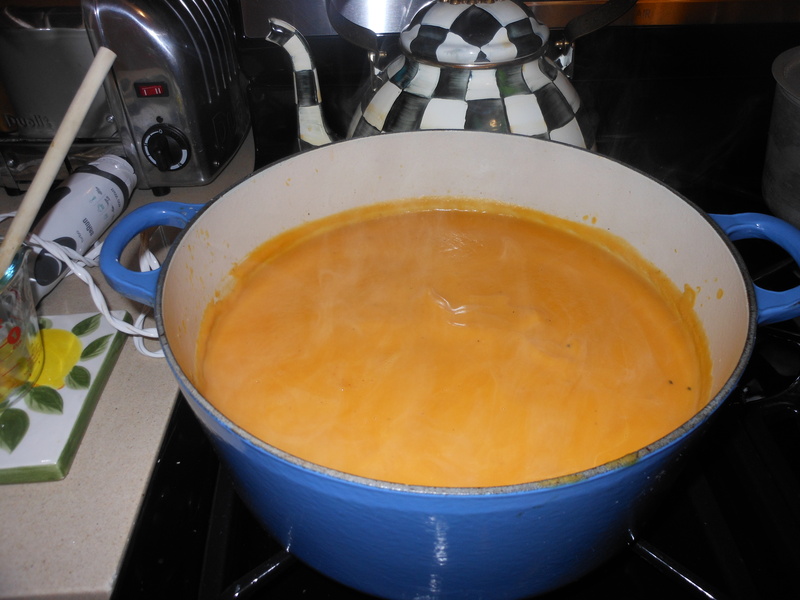 It’s definitely fall and my first soup of the season is almost always butternut squash soup. I’ve simplified the recipe along the way so that now it is just the way Joel and I like it. it’s pretty easy as long as you buy the squash pre – cut (available in every supermarket, and corner produce store). I just made my first batch of the season, and the squash is sweet and delicious. I always add a little butter to it, but you can totally leave it out. It tastes so creamy you’ll swear there’s cream in it, but really, there is none. I love a little freshly grated nutmeg in it too, but you can certainly just sprinkle in a very little bit of already grated nutmeg. I hope your family and friends enjoy this as much as my family does! It’s always on my table for Thanksgiving. A delightful way to start a dinner, or a delicious main dish served alongside a beautiful salad and bread. This can easily be made vegetarian by substituting chicken broth for vegetable broth, which is how I make it on Thanksgiving for Kerri, who is vegetarian. In a heavy Le Creuset (or any other ample size large pot), I heat 3 tablespoons of olive oil. When oil is heated, put in onion and about 1/2 tablespoon of kosher salt. Sweat out the onions until they are translucent (approx. 5 – 8 minutes). If you’re using the butter, add it now too. I then add all of the butternut squash and mix the onions, oil and butter as best I can all over the squash. Next, add enough broth to cover the squash (I used approx. 10 cups of chicken broth to cover). I keep the remaining half a box of broth in case I need it later. Return to a low boil, then bring to a simmer. I let it cook a very long time–at least an hour until soft–and then I turn off the heat and let it sit for a while. I like to make it early and let it sit for as long as possible, because the squash gets very soft. Then right before I am about to serve, I use an immersion blender and blend it into a beautiful smooth soup. If you need more broth, add it as you blend. This is also your salt, pepper and nutmeg moment. Season to taste and blend just until smooth. I leave it in the pot until I need it and then gently warm it up. This soup will keep in the fridge for a few days. It can be frozen as well. Upon defrosting you may need to add more broth. Sometimes I serve this soup with beautiful croutons if I can find them in specialty stores, but it is delicious and beautiful on its own, and very good for you! My family loves it , and I hope yours does too. This entry was posted in soup, vegetables, vegetarian and tagged Creamy Butternut Squash Soup with no Cream. Bookmark the permalink. I make mine with apples & Ginger for a little kick. Miss u.
I have made it with apples, the ginger def. adds kick. Hope all is well with you and the girls. 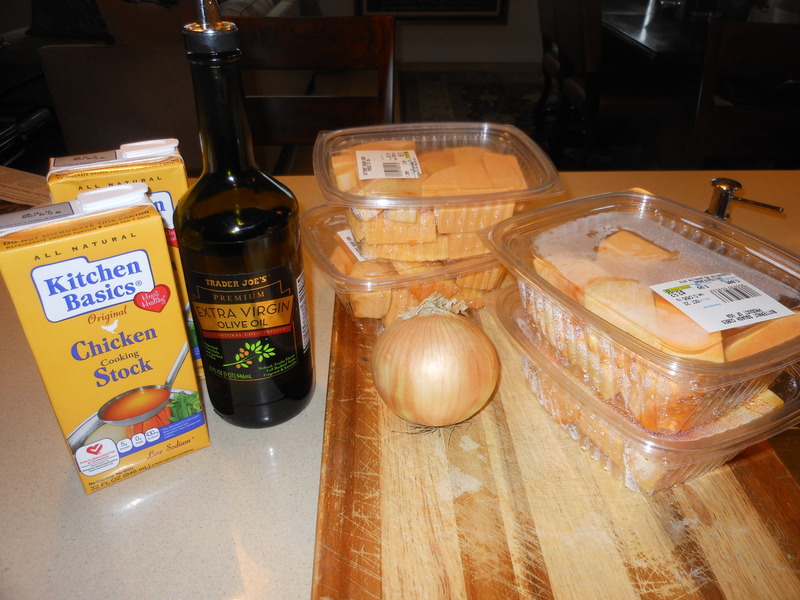 I make this soup as well — with 2 slight differences. First, I toss the butternut squash with a little olive oil and roast it in the oven until it is fully cooked and browned on the edges – it gives the soup an unbelievable flavor! Next, I use shallots instead of onions. 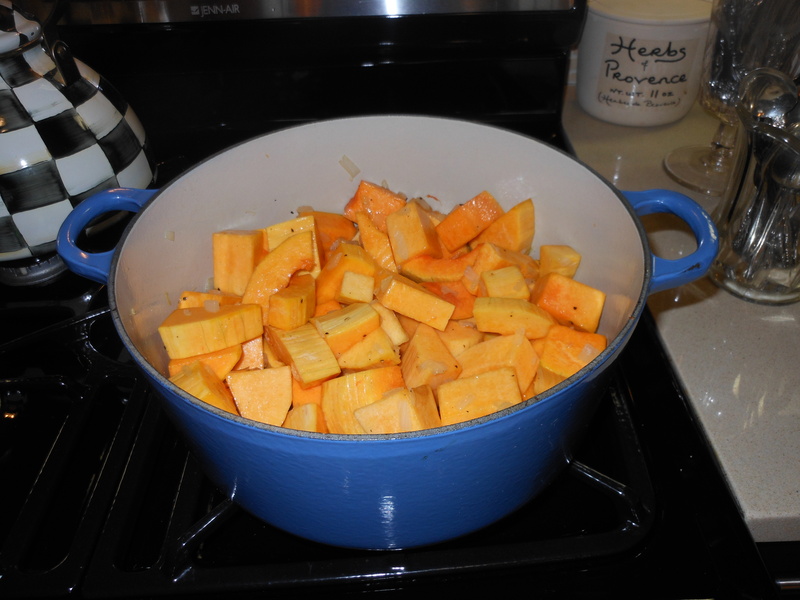 I basically cook it the same way you do yours, only it takes less time in the Le Creuset pot, as the butternet squash is already roasted and soft- so it just needs roughly 20 minutes or so in the broth to fall apart before you blend it with the hand mixer! YUM. I would like to take credit, but this is actually my brother in laws recipe! Posted this last October and it is really an all time winner! If you haven’t made it, you must. It will certainly become a staple for you. It’s Fall , go make a soup. nice meeting you as well, fortuitous for both of us! good luck with all the recipes and hope you enjoy, please feel free to contact me any time if you have any new great recipes you’d like to share or just have a question. Enjoy ! Sounds wonderful; I make something similar. Simple things are often the best! Thanks for coming by More Time at the Table, Candi!